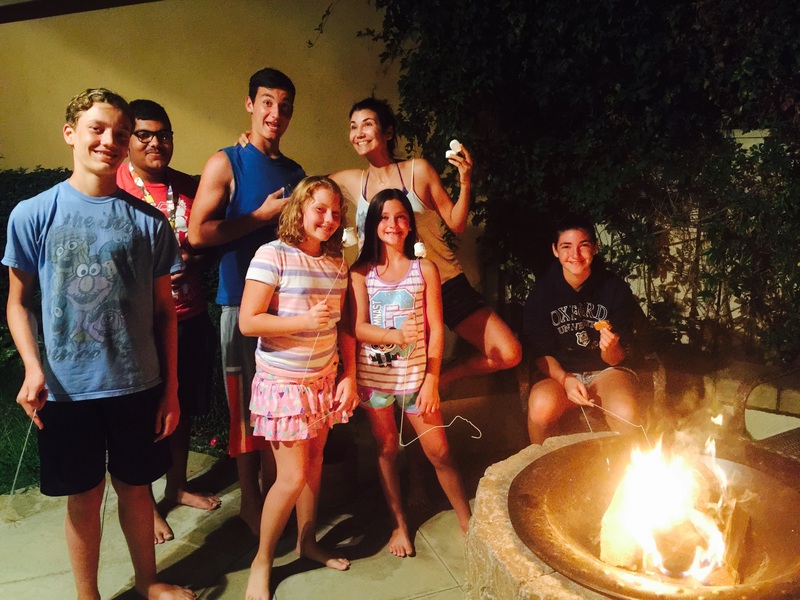 So this is Musaed and my gang and friends and me, acting all crazy, because I can’t possibly take a normal picture, not while eating smores. Nope, just not possible. I’m simply too happy with all that chocolate and marshmallow goodness. So, one of the things I love to do is write and I write a blog. Do you know what that is? He quickly nodded his head. Well, I started a blog when I learned I had a brain tumor last year (can you believe I started this blog a year ago. Holy smokes!!! A whole year!) and I just kept writing and I would love to share your story because I think it would inspire people. He smiled a short tight smile. Something I had seem him do before when he would try to hide a grin that seemed to force its way onto his face. I will change your name and make sure I protect your identity, but I would love to share. What do you think? Oh my gosh… I love this kid. Musaed loves anime movies and books and is a huge, like HUGE, gamer. He is the oldest of eleven children. He has eight sisters who are thoroughly obsessed with Frozen. He even said to Alex at one point during our drive, “If you don’t stop singing that song I am going to jump out of the car.” He was totally kidding. Ummm, well, at least I think he was kidding. We all erupted in laughter.Yes, Jake you finally have another boy around. The odds are getting better. Musaed also has two brothers. He has come to America to study electrical engineering. How did you decide on that, I asked during one of our conversations. Uh, okay, did you say American ambassador? and what were you doing talking with the American ambassador. Oh my gosh, you are killing me (no, I didn’t say that to him, but I thought it. He is very matter of fact so it. So I had to ask lots of questions) …. so what’s the invention. He rattled off a few concepts that I knew and a few I had no freaking idea what in the world he was talking about. All I do know is that he is crazy smart, like builds his own computers and works with radio waves- kind of smart. “I have set my goal on getting a PhD and winning the Nobel Prize,” he announced with all certainty and in such a way that not only did he fully believe that he would, but I was totally convinced as well! Uh yeah, so we really don’t have these kind of conversations in my home. The nobel prize doesn’t really come up over dinner. So, you don’t plan on going home? And I had to pause. Deep breath, dear sisters. 18 years old and death has already been near. Violence. Terrorism. He knows this. And I had to think, dear sisters, what we don’t know. When people are short with us, or mean, or respond in a way that is offensive, do we stop and wonder what they have experienced? And as easy as Musaed is to be around, I would never have known what his eyes had seen and his heart endured. I encourage you, dear sisters, give grace to those around you, for we have no idea where they have walked. Do you miss them? Your friends? and it was beautiful. Full of faces I have never seen and will most likely never seen face to face. In fact, they might be faces he never gets to behold again. And he knew that. He knew coming here was leaving all that he knew behind, perhaps for good. Oh, to give up so much for to come to a land he had ever seen, a life he had yet to build. and I was inspired, dear sisters, inspired. So this is what I know of my new son so far. I know that while he came to America alone, God had other plans for him, that started outside of a stinky airplane toilet. I know that while he left his family behind and mourns that loss, God already provided him an american family that would love him. I know that while he has experienced so much loss and pain, it will be those same experiences that inspire others to be brave, to step out, and do something extraordinary. Musaed continues to be part of our family. He has oodles of questions, like “How do I get a drivers license,” and remarks like “I don’t know how to cook,”that catch me off guard. (yes, we are going to be working on that) He texts me pictures of his room or what he is working on and I oooo and ahhh over it. He loves to tell me how we are his new family and I must admit I love it too! More to come, but for now, dear sisters, please continue to pray for my sweet boy, that he will feel loved and cared for.